It just didn’t have to end this way. Governor David Paterson on a farewell tour, counting down his final days in office. President Obama names Hillary Clinton Secretary of State. What if Paterson had appointed himself as Clinton’s Senate successor? What if Paterson had opened that door? Don’t look at his mouth, look at his actions. Mayor Mike Bloomberg is again declaring he will not be a Presidential candidate, but the proof is in the pudding. Was Cathie Black really the first Choice for Chancellor or was it Geoffrey Canada. Cathie Black, the chairwoman of Hearst Magazines, is taking issue with reports suggesting that she was not Mayor Bloomberg’s first choice to be schools chancellor, saying the mayor told her personally that he had not offered the job to anyone else. Black appeared Friday on Good Day New York. The New York Times and Daily News reported today that Mr. Bloomberg had originally tried but failed to persuade Geoffrey Canada, a Harlem education leader, to take the job. 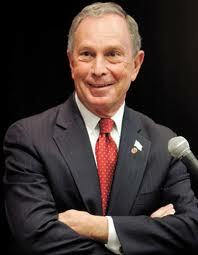 Might “Mayor Mike” be President Bloomberg? Gov David Paterson said something very interesting the other day. Paterson declared he did not want the job of newly-censured Harlem Democrat Charles Rangel in Congress, but went on to add that Mayor Michael Bloomberg is eyeing President Obama’s job. I often drive on the Cross Bronx expressway, passing Elementary School P.S. 70, and reminisce about my school days there. I remember 3rd grade class, and playing on the roof-top gym surrounded by metal bars everywhere so no one would fall. Surprised, but I guess really not shocked is the best way to describe when I picked up the NY Post this morning and saw a story about a current P.S. 70 teacher who was an alleged former prostitute and stripper. I've had a very successful career in journalism, and I am not attacking teachers, but I have to admit that I have always wondered how far I could have gone if I had received the same private school education as many other journalists. Is Bloomberg starting to wear out his welcome? It was bound to happen. Third term Blues for Bloomberg. Voter fatigue is starting to show for New York’s Mayor. A new poll finds his approval rating has dropped below 50 percent for the first time in five years. That’s according to a Marist College Poll released Tuesday.